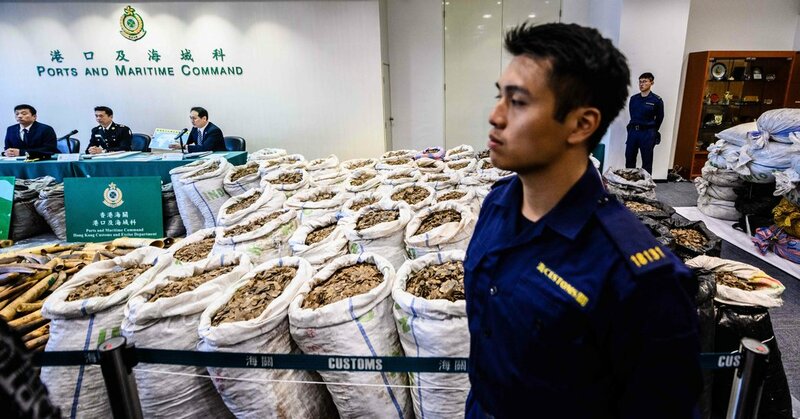 HONG KONG — Officials in Hong Kong said on Friday that they had intercepted a shipment of nine tons of scales from pangolins, the largest seizure the city has ever made of products from one of the most frequently trafficked mammals in the world. A thousand elephant tusks were in the same shipment, officials said. The scales and tusks were seized on Jan. 16, said the customs authorities, who displayed the contraband for reporters. They were found hidden under slabs of frozen meat on a cargo ship that had stopped in Hong Kong on its way to Vietnam from Nigeria, said officials, who estimated the shipment’s value at nearly $8 million. The pangolin is an anteater-like creature covered in large scales. There are lucrative black markets for it in China and Vietnam, where its scales are pulverized for use in traditional Chinese medicine and its meat is served in restaurants as a delicacy. Hong Kong officials estimated that the intercepted scales had come from nearly 14,000 pangolins. The International Union for Conservation of Nature estimated in 2016 that a million pangolins had been poached in the preceding decade. All eight pangolin species are protected under international trafficking laws and two are critically endangered. “The pangolin runs the risk of becoming extinct before most people have even heard of them,” Prince William said in an anti-poaching video in 2014. When confronted by predators, the pangolin curls into a ball. Hunters are said to use machetes to kill them. Officials said the 39-year-old owner of a Hong Kong trading company and his 29-year-old employee had been arrested in connection with the seizure. Under Hong Kong law, smuggling illegal wildlife products is punishable by up to ten years in prison and fines of up to $1.3 million. “Customs have done a great job,” said Alex Hofford, a wildlife campaigner for WildAid. “However, we want the Hong Kong government to take a step further. At the moment, they’re just catching the mules, the people who collect the containers — not the people at the top of the pyramid.” He urged the authorities to let investigators follow large consignments to their destinations and track the smugglers’ finances. Hong Kong has long been a port of entry for illegal wildlife products, including elephant tusks and rhino horns. Lawmakers voted last year to ban all ivory sales by 2021, bowing to pressure from environmental activists. Last year, Hong Kong confiscated almost twice as many pangolin scales, by volume, as it had in 2017.